Last month we helped cater a family party. We were in charge of making three large salads. We made a simple spinach salad with berries, Greek Quinoa Salad, and Southwestern Pasta Salad with Creamy Avocado Dressing. I created the Southwestern Pasta Salad for the party and it has become one of our favorite pasta salads. We make it all of the time now. 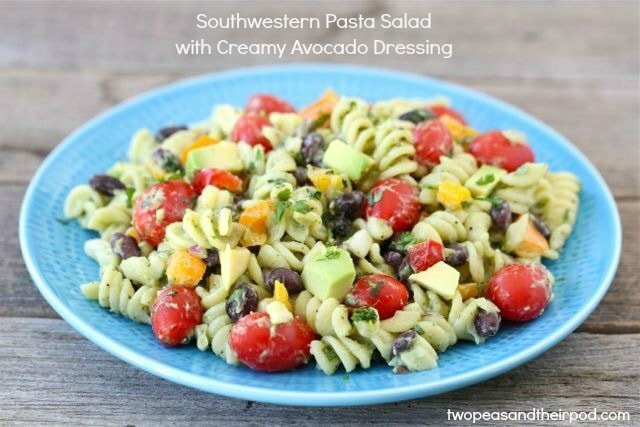 If you like our Creamy Avocado Pasta, I am positive you will love this pasta salad. The pasta salad is loaded with flavor. It has black beans, tomatoes, peppers, onion, sweet corn, avocado and cilantro. And the best part? The creamy avocado dressing. It is rich and creamy, but in a healthy kind of way. The dressing is easy to whip up, just throw all of the ingredients in your blender or food processor and blend until smooth. 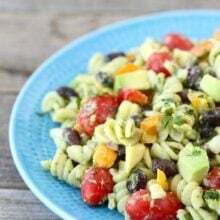 If you are looking for a new pasta salad recipe, give this Southwestern Pasta Salad with Creamy Avocado Dressing a try. It can be enjoyed as a side dish or main dish. 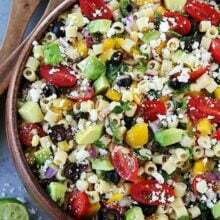 This pasta salad is perfect for picnics, potlucks, parties, or everyday eating. Enjoy! This easy pasta salad is a summer favorite. You will LOVE the creamy avocado dressing! Bring a large pot of water to a boil. Salt the water and stir in the pasta. Cook until al dente. Rinse with cold water and set aside. While the pasta is cooking, make the Creamy Avocado Dressing. Combine all of the dressing ingredients in a blender or food processor and blend until smooth. 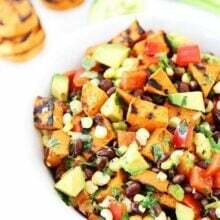 In a large bowl, combine pasta, black beans, tomatoes, peppers, red onion, corn, and chopped avocado. Pour dressing over pasta salad and stir until salad is well coated. Season with salt and pepper. Squeeze fresh lime juice over the salad, so the avocados don't brown. Garnish with chopped cilantro and serve at room temperature or chilled. Note-you may have leftover dressing, depending on how "dressed" you like your pasta salad. If the dressing is too thick, add more buttermilk. Love all the bright colors. Avocado dressing sounds magnif! Mmm – you do some seriously tasty stuff with avocados. I always love that Southwestern combo of corn and black beans, but I can think of a hundred ways to put your avocado dressing to good use! This sounds great! I especially love the sound of that dressing. I could definitely live on this—especially the pregnant me. Now I just need to find someone to make it for me…. Looks delish Maria, can’t wait to try it! Ohhh, this looks sod delicious! I love anything that is southwestern style. Yum!!! This looks absolutely wonderful, but I really dislike cilantro. Any suggestions for alternate herbs? Looks wonderful and I love cilantro! Yum! Oh YUM. That creamy avocado dressing is calling my name! The avocado dressing sounds amazing! Love all the bright colours in this salad. 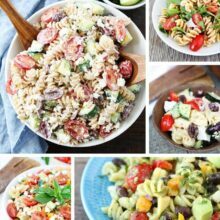 This pasta salad is right up my alley! Avocado dressing and veggies, yum. Thank you for the link love, too, Maria! Wow! This sounds really so healthy and flavourful. Wow! That looks amazing! Love the colors! I love the sound of this avocado dressing! This pasta salad looks very inviting!!! I love this salad, everything about it is perfect for summer! Creamy Avocado Pasta is one of my favorites, and I know this would be equally as good! This salad is so pretty! Love the dressing – must try! These are some of my fave flavors. Wow. Lucky for all who got to partake in it! Great idea! I love making pasta sauce with avocado, and dressing on cold pasta salad is an even smarter idea! Looks great! I am going to give it a try this weekend. You always make the best sounding pasta salads! Anything with avocado! And corn. And cherry tomatoes. 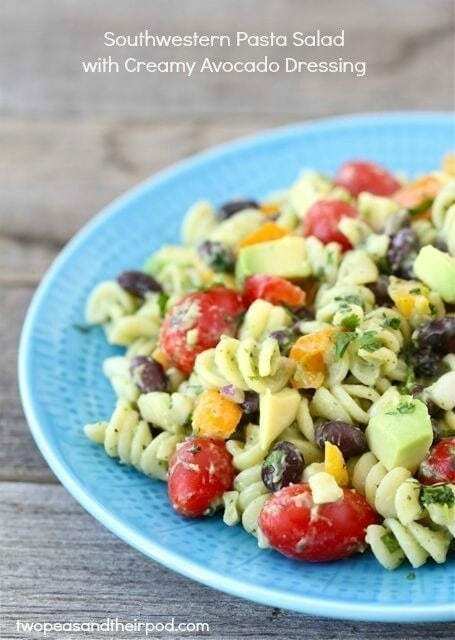 I love everything in this pasta salad, I’m sure it’s delicious! this seriously sounds so incredible…i’m putting it on the menu next week! Holy cow, this looks fantastic! So colorful and flavorful. I absolutely LOVE all of the ingredients in this recipe. Looks like the perfect pasta salad!! Making this next week for sure!! Wow, this looks incredible and I love that it’s so easy! Awesome recipe for using up the end-of-summer produce! This is amazing! Love the avocado dressing!! I’m loving the avocado dressing! What a fabulous way to use up some avocados AND boost your fiber content just a bit a long the way. Looks yummy… one question. Do I need to worry about the dressing darkening like how guacamole does when left out a bit or does the other ingredients take care of that? Wondering if this could be made and brought to a party or made a little ahead, etc.. Thanks! The lime keeps the dressing from browning. You can make it ahead of time! Saving this one in the recipe folder for sure…looks spectacular! I am definitely yearning for that creamy avocado dressing!!!! I can definitely see this being a hit at my next family function! I need to try your avocado dressing. Sounds delightful! Ah . . . the colors of summer! Dressing with greek yogurt AND avocados, right up our alley! so yummy looking! Can you make this a day ahead? Yes, you can make it ahead of time. The lime keeps the dressing from browning. Hmm, this looks just like the recipe I use from I think Eating Well. A lovely light dish to capture the end of summer. Have a great week. Must make this fro lunch ASAP!! Southwestern food should always come with creamy avocado dressing in my opinion! Your recipe for the dressing looks great with all the spices and seasonings! I’ve never tried making it with buttermilk, either which is brilliant. 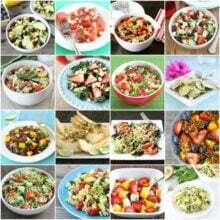 The whole salad looks fantastic and definitely perfect to make in big batches for gatherings! Made this tonight….and delicious!!!! Snuck some into a tupperware for work lunch tomorrow before it was all gone 🙂 Hoping the dressing does not brown overnight! I love the colors in this salad. So gorgeous! I made this for dinner last night,, and I jujst and, LOOOOOVVVED it! We ate it for lunch today…just as good. Thanks!! Deliciousness!! Looks like a perfect salad! I thought I commented on this already, but I guess I didn’t! I adore this recipe! Pinned for dinner next week! Oh I am so in love with this!! This is perfect for a party, especially labor day coming up! I love this recipe!! This is packed full of nutrition and no one would even know it. Thanks for this great idea. I will be making this for an upcoming party! Love the creamy avocado dressing!! This recipe looks right up my alley! Thanks for posting it. This is FANTASTIC! My family could not stop eating it. Thanks for sharing. Just posted about this (and linked back to you) – http://themommygames.wordpress.com/2012/10/03/cooking-the-blogs/. We loved it! K so I finally made this today and all I can say is THANK YOU, THANK YOU, THANK YOU, this is the best veg friendly salad and the dressing is so delicious! How long will the dressing keep in the fridge? I would like this for regular green salads over the course of the week but only have time to cook on the weekend? Will it keep for a week? I haven’t kept the dressing for a week. I have stored it for a few days and it was fine. I made this tonight because I was looking for a pasta salad that was different from the norm. It’s easy to make and I like that the dressing is on the lighter side. However, the green color isn’t super appetizing so I was a little skeptical. It was a huge hit at the BBQ I took it to! I can’t remember the last time I got so many compliments on something and I consider myself to be a pretty decent cook. The only changes I made were to add a dash of Worcestershire to the dressing bc it needed a little something more. I made the dressing several hours ahead and let it sit which I think really helped develop the flavor (although this wasn’t planned). Add some chicken and you have yourself a light summer pasta. Definitely a keeper. Glad you liked the pasta salad! I made this today for a work potluck. It turned out wonderful!! Thanks for sharing. Made this last week and enjoyed it. I found that the dressing recipe as written made more than we needed, so I think I would halve that next time to get the bright, fresh look/taste that the photo advertises. 🙂 Otherwise, it was delicious and I would totally make it again. (love avocados and am learning about homemade dressings) Thanks for the recipe! Hi There! I wanted to let you know I featured you today on Blissful & Domestic Recipes. Stop by and check it out! Hi! May I know how many tsp of salt did you use for the dressing? I am gonna make it for my project in class. Thanks. I probably used a teaspoon, but taste and salt as needed! Everyone has different tastes when it comes to salt! Love your site and recipes. Wanted to know if you list the nutritional information for your recipes. Glad you liked it! Thanks for letting us know! Pingback: Ham and Black Bean Summer Salad | Never Enough Thyme — Never Enough Thyme - Recipes with a slight southern accent. Tried this recipe tonight and it is amazing. Can’t wait to make it again when my other half is back in town 🙂 Maria, your recipes never disappoint! A keeper alright! Substituted pasta with quinoa and we all loved it!